1 A None No Power Seat 1 A is a standard Economy Class seat that Volaris Airlines designates as a Premium seat and is charging an additional fee for. This Premium seat offers additional legroom, however, the proximity to the galley and lavatory may be bothersome. The tray table is in the armrest, making the armrest immovable and slightly reducing seat width. There is no floor storage during takeoff and landing. 1 B None No Power Seat 1 B is a standard Economy Class seat that Volaris Airlines designates as a Premium seat and is charging an additional fee for. This Premium seat offers additional legroom, however, the proximity to the galley and lavatory may be bothersome. The tray table is in the armrest, making the armrest immovable and slightly reducing seat width. There is no floor storage during takeoff and landing. 1 C None No Power Seat 1 C is a standard Economy Class seat that Volaris Airlines designates as a Premium seat and is charging an additional fee for. This Premium seat offers additional legroom, however, the proximity to the galley and lavatory may be bothersome. The tray table is in the armrest, making the armrest immovable and slightly reducing seat width. There is no floor storage during takeoff and landing. 1 D None No Power Seat 1 D is a standard Economy Class seat that Volaris Airlines designates as a Premium seat and is charging an additional fee for. This Premium seat offers additional legroom, however, the proximity to the galley and lavatory may be bothersome. The tray table is in the armrest, making the armrest immovable and slightly reducing seat width. There is no floor storage during takeoff and landing. 1 E None No Power Seat 1 E is a standard Economy Class seat that Volaris Airlines designates as a Premium seat and is charging an additional fee for. This Premium seat offers additional legroom, however, the proximity to the galley and lavatory may be bothersome. The tray table is in the armrest, making the armrest immovable and slightly reducing seat width. There is no floor storage during takeoff and landing. 1 F None No Power Seat 1 F is a standard Economy Class seat that Volaris Airlines designates as a Premium seat and is charging an additional fee for. This Premium seat offers additional legroom, however, the proximity to the galley and lavatory may be bothersome. The tray table is in the armrest, making the armrest immovable and slightly reducing seat width. There is no floor storage during takeoff and landing. 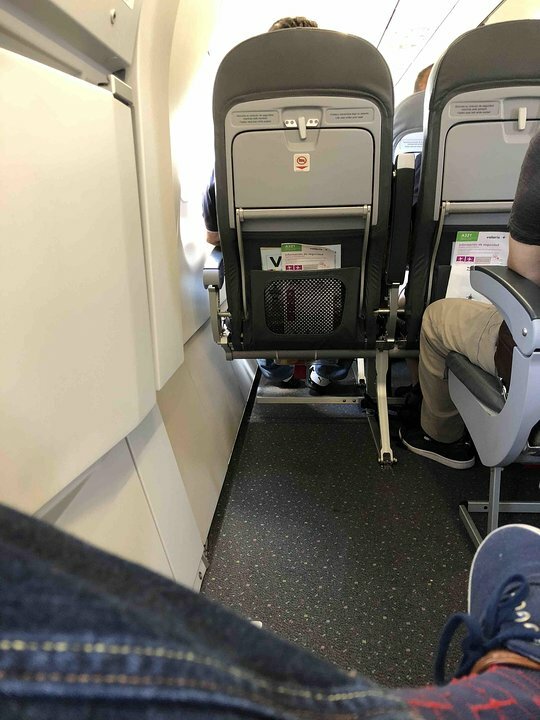 11 A None No Power Seat 11 A is a standard Economy Class seat that Volaris Airlines designates as a Premium seat and is charging an additional fee for. This Premium seat offers additional legroom, however, the tray table is in the armrest, making the armrest immovable and slightly reducing seat width. There is no floor storage during takeoff and landing. 11 B None No Power Seat 11 B is a standard Economy Class seat that Volaris Airlines designates as a Premium seat and is charging an additional fee for. This Premium seat offers additional legroom, however, the tray table is in the armrest, making the armrest immovable and slightly reducing seat width. There is no floor storage during takeoff and landing. 11 C None No Power Seat 11 C is a standard Economy Class seat that Volaris Airlines designates as a Premium seat and is charging an additional fee for. This Premium seat offers additional legroom, however, the tray table is in the armrest, making the armrest immovable and slightly reducing seat width. There is no floor storage during takeoff and landing. 11 D None No Power Seat 11 D is a standard Economy Class seat that Volaris Airlines designates as a Premium seat and is charging an additional fee for. This Premium seat offers additional legroom, however, the tray table is in the armrest, making the armrest immovable and slightly reducing seat width. There is no floor storage during takeoff and landing. 11 E None No Power Seat 11 E is a standard Economy Class seat that Volaris Airlines designates as a Premium seat and is charging an additional fee for. This Premium seat offers additional legroom, however, the tray table is in the armrest, making the armrest immovable and slightly reducing seat width. There is no floor storage during takeoff and landing. 11 F None No Power Seat 11 F is a standard Economy Class seat that Volaris Airlines designates as a Premium seat and is charging an additional fee for. This Premium seat offers additional legroom, however, the tray table is in the armrest, making the armrest immovable and slightly reducing seat width. There is no floor storage during takeoff and landing. 2 A None No Power Seat 2 A is a standard Economy Class seat that Volaris Airlines designates as a Premium seat and is charging an additional fee for it. The Premium seats offer additional legroom. 2 B None No Power Seat 2 B is a standard Economy Class seat that Volaris Airlines designates as a Premium seat and is charging an additional fee for it. The Premium seats offer additional legroom. 2 C None No Power Seat 2 C is a standard Economy Class seat that Volaris Airlines designates as a Premium seat and is charging an additional fee for it. The Premium seats offer additional legroom. 2 D None No Power Seat 2 D is a standard Economy Class seat that Volaris Airlines designates as a Premium seat and is charging an additional fee for it. The Premium seats offer additional legroom. 2 E None No Power Seat 2 E is a standard Economy Class seat that Volaris Airlines designates as a Premium seat and is charging an additional fee for it. The Premium seats offer additional legroom. 2 F None No Power Seat 2 F is a standard Economy Class seat that Volaris Airlines designates as a Premium seat and is charging an additional fee for it. The Premium seats offer additional legroom. 24 A None No Power Seat 24 A is a standard Economy Class seat that has limited recline due to the Exit Row behind. 24 B None No Power Seat 24 B is a standard Economy Class seat that has limited recline due to the Exit Row behind. 24 C None No Power Seat 24 C is a standard Economy Class seat that has limited recline due to the Exit Row behind. 24 D None No Power Seat 24 D is a standard Economy Class seat that has limited recline due to the Exit Row behind. 24 E None No Power Seat 24 E is a standard Economy Class seat that has limited recline due to the Exit Row behind. 24 F None No Power Seat 24 F is a standard Economy Class seat that has limited recline due to the Exit Row behind. 25 A None No Power Seat 25 A is a standard Economy Class seat that Volaris Airlines designates as a Premium seat and is charging an additional fee for. This Premium seat offers additional legroom, however, the tray table is in the armrest, making the armrest immovable and slightly reducing seat width. There is no floor storage during takeoff and landing. 25 B None No Power Seat 25 B is a standard Economy Class seat that Volaris Airlines designates as a Premium seat and is charging an additional fee for. This Premium seat offers additional legroom, however, the tray table is in the armrest, making the armrest immovable and slightly reducing seat width. There is no floor storage during takeoff and landing. 25 C None No Power Seat 25 C is a standard Economy Class seat that Volaris Airlines designates as a Premium seat and is charging an additional fee for. This Premium seat offers additional legroom, however, the tray table is in the armrest, making the armrest immovable and slightly reducing seat width. There is no floor storage during takeoff and landing. 25 D None No Power Seat 25 D is a standard Economy Class seat that Volaris Airlines designates as a Premium seat and is charging an additional fee for. This Premium seat offers additional legroom, however, the tray table is in the armrest, making the armrest immovable and slightly reducing seat width. There is no floor storage during takeoff and landing. 25 E None No Power Seat 25 E is a standard Economy Class seat that Volaris Airlines designates as a Premium seat and is charging an additional fee for. This Premium seat offers additional legroom, however, the tray table is in the armrest, making the armrest immovable and slightly reducing seat width. There is no floor storage during takeoff and landing. 25 F None No Power Seat 25 F is a standard Economy Class seat that Volaris Airlines designates as a Premium seat and is charging an additional fee for. This Premium seat offers additional legroom, however, the tray table is in the armrest, making the armrest immovable and slightly reducing seat width. There is no floor storage during takeoff and landing. 3 A None No Power Seat 3 A is a standard Economy Class seat that Volaris Airlines designates as a Premium seat and is charging an additional fee for it. The Premium seats offer additional legroom. 3 B None No Power Seat 3 B is a standard Economy Class seat that Volaris Airlines designates as a Premium seat and is charging an additional fee for it. The Premium seats offer additional legroom. 3 C None No Power Seat 3 C is a standard Economy Class seat that Volaris Airlines designates as a Premium seat and is charging an additional fee for it. The Premium seats offer additional legroom. 3 D None No Power Seat 3 D is a standard Economy Class seat that Volaris Airlines designates as a Premium seat and is charging an additional fee for it. The Premium seats offer additional legroom. 3 E None No Power Seat 3 E is a standard Economy Class seat that Volaris Airlines designates as a Premium seat and is charging an additional fee for it. The Premium seats offer additional legroom. 3 F None No Power Seat 3 F is a standard Economy Class seat that Volaris Airlines designates as a Premium seat and is charging an additional fee for it. The Premium seats offer additional legroom. 36 C None No Power Seat 36 C is a standard Economy Class seat whose proximity to the lavatories and galley may be bothersome. 36 D None No Power Seat 36 D is a standard Economy Class seat whose proximity to the lavatories and galley may be bothersome. 37 A None No Power Seat 37 A is a standard Economy Class seat located in the last row of the plane. This seat may have limited recline. The proximity to the lavatory and galley may be bothersome. Also, you will be among the last passengers to deplane upon arrival. 37 B None No Power Seat 37 B is a standard Economy Class seat located in the last row of the plane. This seat may have limited recline. The proximity to the lavatory and galley may be bothersome. Also, you will be among the last passengers to deplane upon arrival. 37 C None No Power Seat 37 C is a standard Economy Class seat located in the last row of the plane. This seat may have limited recline. The proximity to the lavatory and galley may be bothersome. Also, you will be among the last passengers to deplane upon arrival. 37 D None No Power Seat 37 D is a standard Economy Class seat located in the last row of the plane. This seat may have limited recline. The proximity to the lavatory and galley may be bothersome. Also, you will be among the last passengers to deplane upon arrival. 37 E None No Power Seat 37 E is a standard Economy Class seat located in the last row of the plane. This seat may have limited recline. The proximity to the lavatory and galley may be bothersome. Also, you will be among the last passengers to deplane upon arrival. 37 F None No Power Seat 37 F is a standard Economy Class seat located in the last row of the plane. This seat may have limited recline. The proximity to the lavatory and galley may be bothersome. Also, you will be among the last passengers to deplane upon arrival. 4 A None No Power Seat 4 A is a standard Economy Class seat that Volaris Airlines designates as a Premium seat and is charging an additional fee for it. The Premium seats offer additional legroom. 4 B None No Power Seat 4 B is a standard Economy Class seat that Volaris Airlines designates as a Premium seat and is charging an additional fee for it. The Premium seats offer additional legroom. 4 C None No Power Seat 4 C is a standard Economy Class seat that Volaris Airlines designates as a Premium seat and is charging an additional fee for it. The Premium seats offer additional legroom. 4 D None No Power Seat 4 D is a standard Economy Class seat that Volaris Airlines designates as a Premium seat and is charging an additional fee for it. The Premium seats offer additional legroom. 4 E None No Power Seat 4 E is a standard Economy Class seat that Volaris Airlines designates as a Premium seat and is charging an additional fee for it. The Premium seats offer additional legroom. 4 F None No Power Seat 4 F is a standard Economy Class seat that Volaris Airlines designates as a Premium seat and is charging an additional fee for it. The Premium seats offer additional legroom. Volaris passengers have the option of enjoying several music channels. Just choose your favorite rhythm and enjoy it throughout the duration of your flight. Volaris offers snacks and beverages for purchase. Passengers can enjoy different treats such as cookies and granula fruit bars or a variety of chips. Volaris also offers juice, soda, water, and coffee. Alcoholic beverages, including cocktails, are being served on most flights longer than 90 minutes. Volaris Airlines operates the Airbus A321 on short-haul flights. This aircraft flies solely with 220 seats of Economy Class. Volaris Airlines offers passengers Premium seats. The Premium seats are located in rows 1-4 and the exit rows and have additional legroom. These seats can be booked for an extra fee. the seat 10B is not limited to recline. The seats in row 11, are considered "premium" by the airline, with additional fees. Volaris has recently turn into a ultra low cost carrier, they no longer offer free overhead TV entertainment as they removed all tv to "save weight". Volaris flies 1 versions of Airbus A321 .